Nowadays we are all busy, many of us exhausted after running at full capacity all day. That’s us but what of your network, how does that survive? What happens when our poor networks are already working at capacity? Apologies if you are already fully aware of the great work of a Midspans but we felt it prudent to introduce for those who are maybe not across this great piece of kit. MicroSemi Midspans are like a hub, it has the capability to transmit power to terminals, UPS, access points, IP phones, IP cameras, control units and more. Midspans require no changes to the existing switch or cabling, and are generally compatible with any Ethernet switch. Ideally they should be inserted between the existing switch and the powered devices. Midspans optimize network deployment and flexibility where powering capabilities can be upgraded independent of data requirements. When it is necessary to replace a switch, this can be done without having to pay for both data and power again. An absolute win / win! This flexibility is particularly vital to companies that cannot justify the upgrade costs to PoE-enabled switches – especially if their non-PoE switch has recently been installed, or require very few ports with PoE capability. Midspans utilise a gigabit interface to focus support for those with high-power PTZ cameras and thin clients. Midspans include the ability to use DC inputs with external power supplies for incremental power capacity or redundancy. 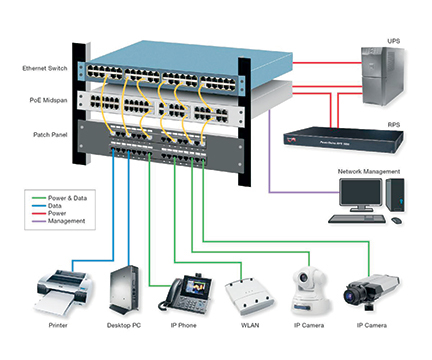 A Midspan-based PoE infrastructure is also safer and easier to manage and maintain. Safety is improved because Midspan’s can detect and automatically disconnect non-PoE-compliant devices in the event of overload, short circuit or under-load conditions. Midspans also deliver remote power management – great for unit scheduling, UPS power monitoring and Web-based monitoring. Support for both IPv4 and IPv4/6 addressing allows simple and efficient monitoring, management, control and resetting of powered devices. Remote power management increases in importance with network size and complexity. Malfunctioning remote devices can be reset remotely, eliminating an expensive service call. Network administrators can centrally control multi-site or multi-building installations, with support for immediate alert. While serving as the premier intelligent network power solutions provider, they are committed to empower their partners’ success through innovative industry leading network power systems and premier partner opportunities. This is why we are always excited working with our innovative suppliers! Microsemi PoE Systems offer industry leading Power over Ethernet (PoE) solutions for any PoE situation. Microsemi® offers a unique catalogue of outdoor PoE systems to support outdoor installations in even the most extreme situations. All outdoor PoE systems are IEEE 802.3 at compliant and backward compatible. Available in a range of power levels and port configurations, there is a PoE midspan available for your next network upgrade. PowerDsine 9001GO Power over Ethernet (PoE) single- port Midspan offers a cost effective, fully IEEE 802.3af/802.3at compliant solution for outdoor installations, guaranteeing 30 Watts of power and ensuring safe and reliable operation in outdoor environment of any standard PoE data terminal. It allows wireless LAN access points, security network cameras and other IP terminals to receive power, along with data, over standard Ethernet cables, leaving network infrastructure completely unaltered.The 9001GO also offers surge protection for both the AC and the PoE ports ensuring the indoor equipment is protected from outdoor surges. PowerDsine 9501GO Power over Ethernet (PoE) single- port midspan offers a fully IEEE 802.3at compliant solution for outdoor installations, guaranteeing 60 Watts of power while ensuring safe and reliable operation in outdoor environments. It allows wireless LAN access points, security network cameras and other IP terminals to receive power, along with data, over standard Ethernet cables, leaving network infrastructure completely unaltered. The 9501GO also offers surge protection for both the AC and the PoE ports ensuring the indoor equipment is protected from outdoor surges. If you require any further information be sure to contact our team who would only be too happy to help.